You don’t have to go to seminary in order to appreciate and understand the Bible. We are privileged to live in a time when we have unprecedented tools for studying the Bible and more good, solid Bible translations than ever before in Christian history. No excuses. If you can understand your portfolio, you can understand the Bible. If you can understand football, you can understand the Bible. If you can balance your checkbook, you can study the Bible. Maybe you are thinking, “Well, I can’t just sit around and pray all the time.” That’s certainly true, but how often do you pray? It’s sad to see Christians who are more passionate about their portfolio than their marriage. It’s really tragic. No matter how much wealth we may acquire for our family, the truth is that the the most important investments our families need involve our time, our attention, and our influence. Certainly, I believe the Bible teaches that every Christian should tithe to their church, but being invested in the church means far more than our money. Every single Christian can make a difference in their church in some way. In fact, most Christians are capable of making far more of a difference than they ever dreamed. Certainly all of us who are parents should invest in our children, but I believe we should look even beyond them. There are scores of young adults all around us who crave relationships, models, and mentors. They are far more open than you may think. Many of them are married (or want to be married) but have never seen a healthy marriage. Others are trying to be fathers or mothers, but never had much of a relationship with their own father or mother. Look around and pray. I almost guarantee you that you will find some young adult that you can invest in. 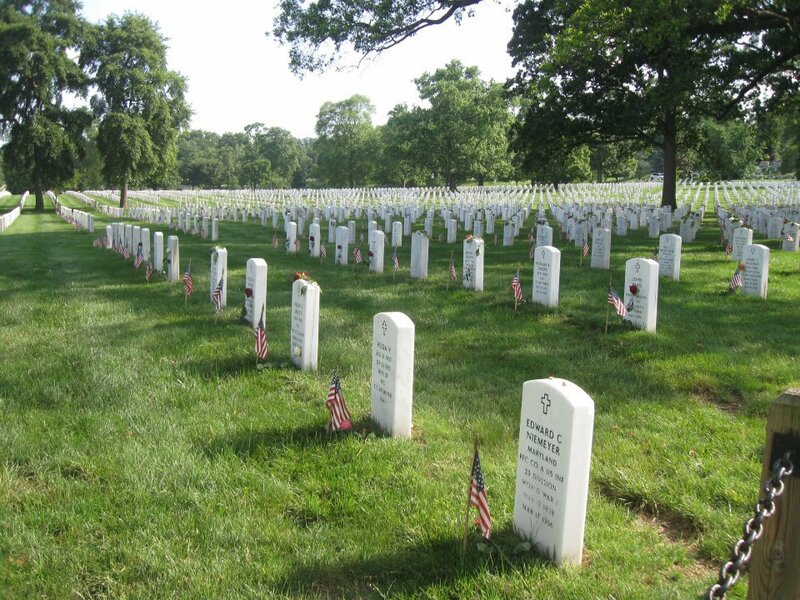 Yes, we had the privilege of visiting Arlington National Cemetery on Memorial Day. If you have never been there, pictures and words cannot describe it. If you have been there, you know what I am talking about! All of the ceremonies had taken place earlier in the day, and we arrived in the late afternoon and enjoyed a couple of wonderful hours there with light crowds. Later on in our trip to Washington D.C. we visited the Vietnam Memorial. 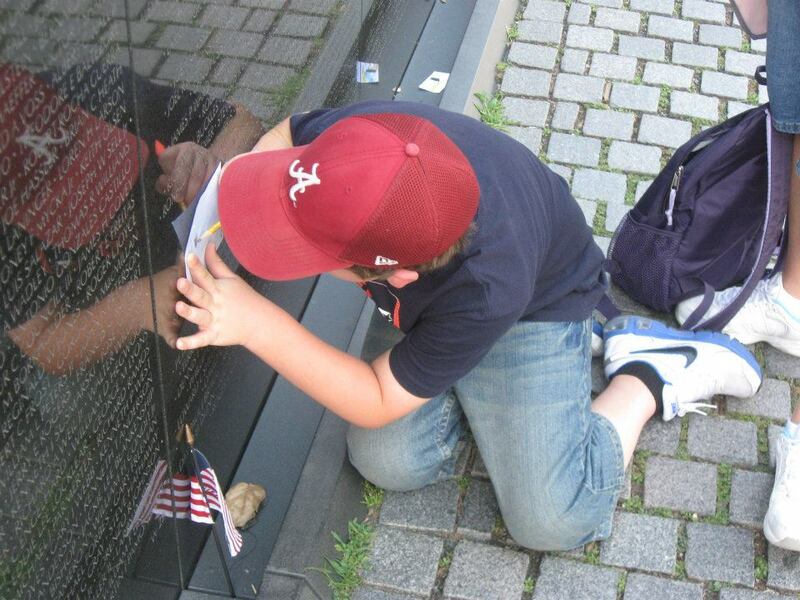 I had always wanted to see it particularly because I have a family member whose name is one of 50,000+ inscribed on that wall. My mom’s brother, Royce Hall, was drafted during the Vietnam War and died there. My mom was pregnant with me when that happened, so I never had the privilege of meeting my uncle Royce. It was a great privilege to take my boys there, find his name, and spend a few minutes remembering him. Below is a photo of Daniel tracing his name on the wall. Yes, I was part of class of 1988 at Ider High School. There were 72 of us in our graduating class. As I look at this picture of my alma mater, I am filled with great memories and joy. I don’t remember the buildings; I remember the people. I remember my friends and classmates. I won’t even attempt to name them because I will leave someone out. There is a special sense of belonging among those you went to high school with. Occasionally, I run into one of my classmates and it’s always a joy. We are old enough now that it doesn’t matter who was in what group or who was popular. We are just glad to see one another – no matter who it is. Unfortunately some members of our class have passed away – some due to illness and some due to tragedy. The class of ’88 has been reminded to be thankful for every day of life. As I look at this picture, I am reminded of just how much Ider High School has meant to my life. It was there that learned to do math and acquired critical thinking skills. It was there that I was taught to love writing. It was there that I played sports and learned the value of hard work and being on a team. It was there that I learned to respect authority – even if I didn’t understand or agree with it. It was there that I was taught to do my best and never settle for average. It was there that I learned to get along with people and function with others. It was there that I learned to type (yes they actually taught that!) It was there that I learned to be self-disciplined and study. In short, it was there that I grew up and came of age. I will never forget Mr. Adams’ biology class or Mr. Fuller’s science class. History with Mr. Williams, drivers ed with Coach Allday and science with Coach Daniel will be forever etched in my mind. I can still see Mr. Hardman coming down the hall. I can still smell the locker room of the Gordon Scott Gymnasium, hear the cheers of the pep rallies, and feel the Fall breeze as I walked up to Hardman Stadium for Friday night football. I remember yearbook staff and AP English. I remember homecoming parades, scholars bowl, and 2nd in the state drama team! I remember the Hamricks and the Brooks families who opened their home (and their kitchen) to our entire class because they knew that teenagers needed a safe place to gather and hang out – but with adult supervision! Were there negative things about high school. I am sure there were, but I choose to remember the best and forget the rest. I have often said that I am thankful I grew up on Sand Mountain. 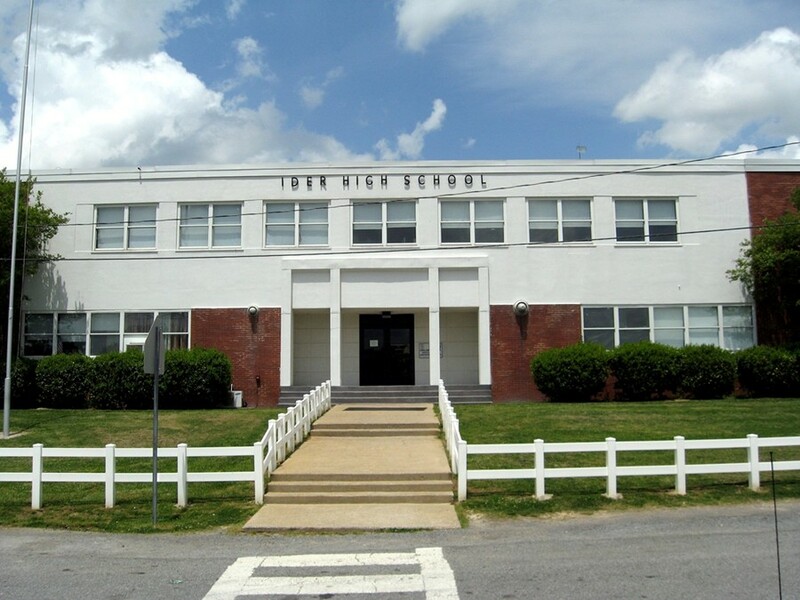 However, I want specifically and publicly to say that I am thankful I grew up in Ider, Alabama and went to Ider High School. I will always be an Ider Hornet. To any members of the class of ’88 who read this blog, I love each and every one of you, and I would love to hear from any and all of you! 1) Have courage to do what God wants you to do. David was certainly a very gifted man, but many gifted men have lived and died without accomplishing much. David had a deep faith, but he took courage and did what God had for him to do. It took courage to face Goliath. It took courage to conquer Jerusalem and unite the kingdom. It took courage win battles and greatly expand the kingdom. It took courage to “keep on keeping on” after terrible sin, humiliation, and trouble in his own family. It takes courage to live for the Lord today. It takes courage to stay married. It takes courage to raise children. It takes courage to grow old. It takes courage to endure grief and loss. David is a great example of one who had a courageous faith. 2) We choose to sin, but we do not get to choose the consequences. David sinned terribly with Bathsheba and then sinned more terribly by trying to cover it up. Those were his choices. However, the consequences were God’s choices. David paid a heavy price in his family for years to come in ways that he never dreamed. 3) Accept the fact that you will die with unfulfilled dreams. For all of the great things that David accomplished, there was one great dream he did not get to accomplish: building God’s temple. Why? The Lord himself would not allow David to do it. David went to his grave with no temple for the Lord. It was an unfulfilled dream, but David did not get bitter about it. One of Satan’s favorite strategies is to make us bitter over one or two things that did not go our way and overlook hundreds of great blessings! How did David keep from bitterness? Rather than focusing on what God did not let him do, David focused on what God had enabled him to do! 4) Stay humble and appreciative of God’s grace. Even though he was a wealthy, powerful king, David always remembered that he was simply a shepherd boy that God had chosen. David expresses his absolute amazement that the Lord had chosen one like him to be king and rule the people of God. 5) Help the next generation succeed. In the last recorded words of David found in scripture (1 Chronicles 28-29) a powerful exchange takes place. David recognizes the Lord has chosen his son Solomon to succeed him and be the one who would get to build the temple. David spends exactly one verse talking about his kingship and then quickly turns his attention to Solomon – encouraging him and instructing him. David actually helped the next generation succeed. 6) Determine to point people to the Lord until your last breath. As David came to the end of his life, he gave glory to God and reiterated that everything was the Lord’s! Even with all he had been through, David did not die bitter. He died praising the Lord. 7) The plan of God is awesome! There are tons of great things to know about the life of David, but the most important one is that God’s covenant with David (to establish his throne forever) was ultimately fulfilled in Christ. Read Matthew 1:1 and see how it ties together David and our Lord Jesus Christ. 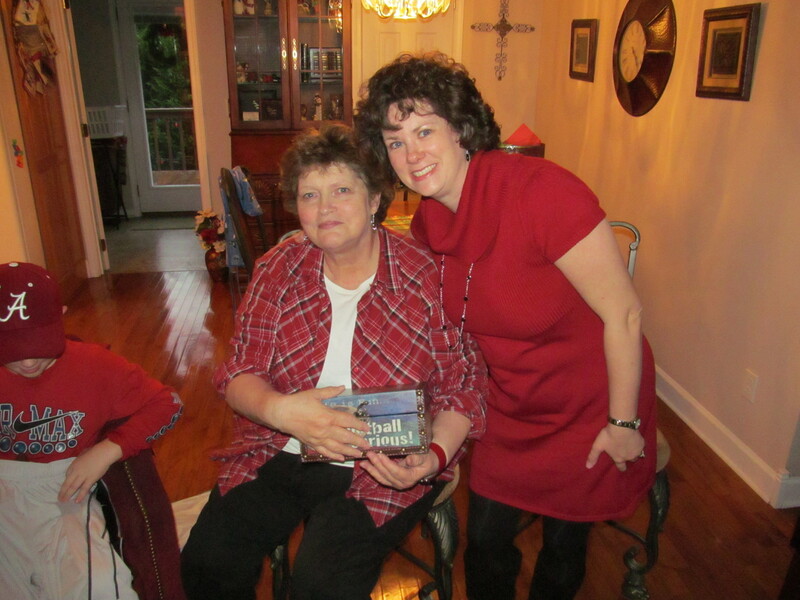 On the left is my mother, Janice Corbin. I am very blessed to have had a good mother who loved me and, most of all, taught me to love the Lord and His Word. In addition to those big things, she taught me countless “little things” that still shape me even to this day. It’s a joy to me to see her enjoying my sons. In fact, if you look closely at this picture, you will see Daniel opening Christmas presents next her. I almost cropped him out of this picture, but decided to leave him in because that captures my mom well. She’s actually holding one of Daniel’s Christmas presents. She’s a giver. She gave so much to me over the years and now she is giving to my boys. Mom, I love you and thank the Lord for you on this day! The other lady in this picture is my beautiful wife, Becky. She is the love of my life and the mother of our two boys. The sacrifices she makes for me and our boys are incalculable. In watching all that she does for our sons, I have a better appreciation of all my mother did for me. She is not a sports fan, but she certainly spends a good portion of her life at ball games because our sons are playing. In fact, she’s even been known to get excited at a few of them! Thank you, Becky, for being a great wife and mother. I love you and thank the Lord for you on this day! As he preached, he pointed out verbs in these verses that are in the perfect tense. “Has given” in each verse is the translation of one Greek verb. The perfect tense has no exact equivalent in English. The perfect tense expresses something that happened or was done in the past, but is still in effect right now. One Greek grammar that I have in my library says the perfect tense has as much to do with the present as it does with the past because it describes a present result of a past action. Keep that fact in mind. These verses are expressly for believers. They were originally written to Christians who were facing an increasingly hostile culture and who were suffering for their faith even to the point of death. To those Christians the Holy Spirit inspired Peter to remind them of two great things God had given them: everything required for life and godliness (v. 3) and the promises of God (v. 4). Let’s ponder those for a moment. I believe that many Christians live their lives everyday as if God has not given them these two things. They are overlooked in way too many Christian lives. Do you need wisdom to make a decision? Do you need power to overcome a particular temptation? Do you need the strength to do the right thing even though you feel like doing the opposite? Do you need encouragement? V. 3 says that God has given you every single thing you will ever need to live for Him. Remember, this is the perfect tense – meaning God gave it to you in the past (the moment you became a believer) and it is still available to you right now. Think about that. In addition, v. 4 tells us that God has given us “very great and precious promises” so that we might become more and more like Christ. Again, this is the perfect tense. God gave them to us at a point in time in the past, but they are still in effect right now. We can stand on the promises of God at all points along the way because they have once and for all been given to us. In his message, Dr. Jimmy Jackson emphasized that the perfect tense eliminates the possibly that what God has given could run out or be rescinded. We absolutely have available to us every thing we need for life and godliness. It will never run out, burn out, or expire. We may be living in our own strength and without prayer, but this divine power to live is available to us all the time. It’s the same with God’s promises. He has given them and they are there, no matter if we are availing ourselves of them or not. I’m personally convinced that many Christians overlook these powerful truths. They either do not know or they live as if they do not know that the Lord has provided everything they need to live for Him. They live in defeat overlooking the fact that the promises of God are there to claim 24/7. As you begin this work week, don’t be a Christian who overlooks them, but rather be a Christian who lives in the power of them! I just came across this interview from USA Today. The Catholic Archbishop of San Francisco gives a very thoughtful defense of traditional marriage and the life of the unborn. While I certainly would have many theological disagreements with Archbishop Cordileone, I do admire his very strong stand on these issues and his responses are well worth taking your time to read. I particularly appreciated his answer to the final question regarding the trends in the courts and in society going against him. That’s a short, simple verse, but boy is it packed with meaning. First of all, the Greek word translated “rejoice” is chairete which has several shades of meaning as used in the New Testament. According to the language tools I consulted, the word means “to greet, to be glad, to have joy…” Rejoicing is something that all of us have done at many points in our lives. We get what it means to rejoice. What we often miss is the source of our rejoicing. Did you notice that the Lord is to be our place of rejoicing? Rejoice “in the Lord…” Our joy is to come from the Lord. He makes us glad. This isn’t to say that we shouldn’t enjoy life. We should enjoy our family and friends. We should enjoy our careers and the blessings of work. We should enjoy healthy recreation and leisure. We should enjoy life, but we do that knowing that life hurts and we will often be disappointed. However, joy goes deeper than our circumstances. True joy comes from the Lord. That is why we are told to rejoice in Him. Many Christians are miserable right now because they are looking in the wrong places for their joy. In this verse, we are also told to rejoice in the Lord “always.” In the original Greek, this word means “always.” Rejoice in Him all the time -in good times and bad. Rejoice in the Lord when the kids are doing well and rejoice in the Lord when one of them rebels. Rejoice in the Lord when things are great in your marriage and rejoice in the Lord when things haven’t been great in your marriage in years. Rejoice in the Lord when you are young and rejoice in the Lord when you are old. Rejoice in the Lord when you love your job and rejoice in the Lord when you hate your job and pray every day for another one! If the Lord is truly our joy, then we can look to Him in every single situation of life. Think about it. Finally, this verse teaches us that to rejoice is our choice. Philippians 4:4 begins a series of imperatives for believers. It is no accident that rejoicing in the Lord begins the list because that is the foundation for Christian behavior. To rejoice is a choice. We can choose to rejoice in our Lord, no matter what we are facing or how we feel. We can choose to rejoice in the Lord as we finish reading a blog post! Again, I say rejoice!